Its been awhile since I posted, and I'm back with a product emptied and ready to be reviewed. 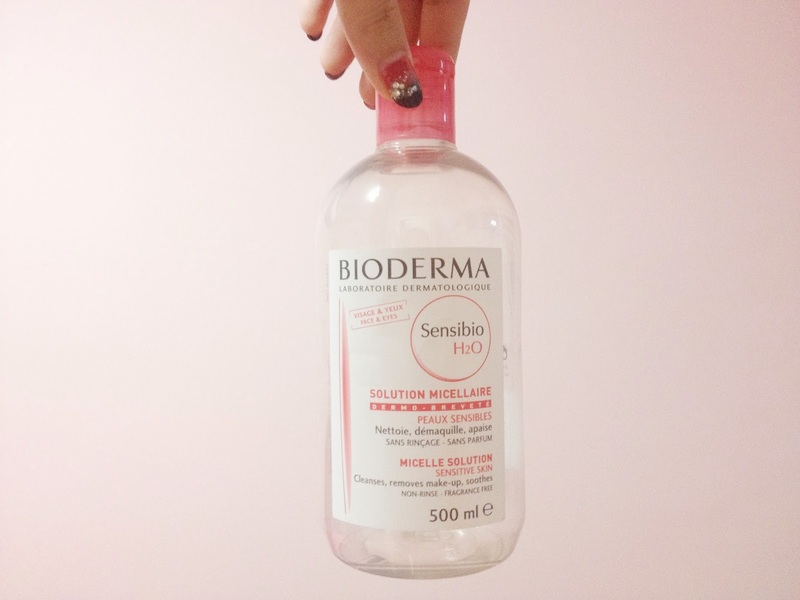 Its the Bioderma Sensibio H2O Micelle Solution for Sensitive Skin, and its the 500ml red bottle. I dived right into the largest size when I ran out of my previous makeup remover because I heard some good reviews about this, and it was more worth it in this size ($49 or $39, at Guardian). I would consider this an impulse buy because I was just shopping around and I was like "I think I heard that this was good?" so I bought it lol. I don't know how long I have used it for, but I reckon its about 3 months. Initially, I didn't like it as I felt like it took like 5 cotton pads to remove the makeup off my entire face. Its quite a lot, comparing to the 3 cotton pads per face when I was using Bifesta. (I minded the amount of cotton pads used because it measures the amount of friction put onto your face just to remove makeup) I thought it was just very average makeup remover. But.. I came to love it when it was down to half the bottle. I did more research on this product (come on, what happened to the good stuff people said about it) and found it to be more suited for me, as a cleanser. I'm not even sure if I'm using it the correct way but I wipe my face with this in place of my usual foam cleanser every morning, and it helps soothe my acne, a lot. I rinse it off with water though it is not required, because I felt that it has this weird sticky feeling afterwards, or too dry and smooth afterwards. At night, I use it to remove my makeup, then a foam cleanser (Etude House AC Clinic Foam Cleanser, pretty drying but good for acne) and then to my skincare, which is currently just aloe vera gel lol. No thanks to the Chinese New Year feasting that broke me out even more recently :( Because of this routine, it kept my acne under control and I do see some improvement. I'll probably use it just as a face makeup remover but for my eye area, I still need the oil removers to minimise friction that cotton pads do, because I realised that my eye area is getting really dry from Bioderma :( Overall, I recommend this product if you are acne-prone, and have combination skin. 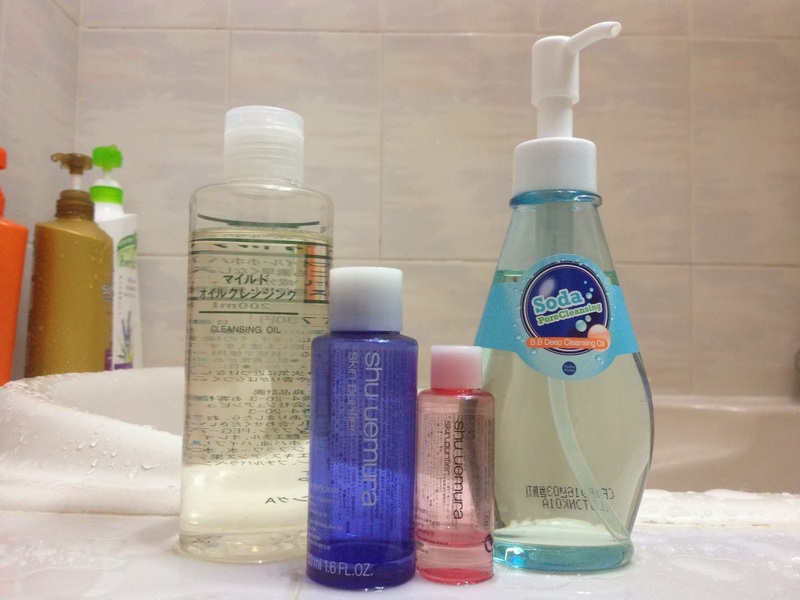 I believe there's the blue one for hydration and green one for sebum care, but I prefer this one for my skin type. But! Before getting a second bottle, I'm gonna try out some cleansing oils that I recently acquired, first :P Left to right: MUJI Cleansing Oil, Shu Uemura Cleansing Oils, and Holika Holika Soda Pore Cleansing BB Deep Cleansing Oil. I am down to the last drops of Shu Uemura ones, and it feels soooo comfortable removing makeup with these. But we'll see how the others fare, haha.